A Spicy Paneer Cheese Toastie with Mango Chutney, some Chickpea Dokla (bite-sized snacks tempered with toasted coconut and mustard seeds), or perhaps some Carrot and Pistachi Halwa, a sweet and sticky afternoon pick-me-up, washed down with NimboboPani (a sweet and salty refreshing lime soda); the recipes in Bombay Lunchbox have exotic names with flavours to match. 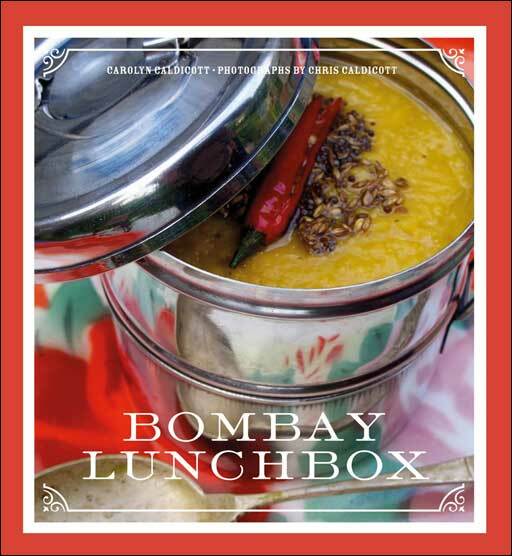 Renowned for her imaginative yet accessible recipes, Carolyn Caldicott combines anecdotes and recipes from Anglo-Indian cookery with the culture of the ‘Tiffin’ lunchbox, cooked at home and delivered to the workplace in characteristic stainless steel tiered tins. Carolyn’s collection of sweet and savoury recipes for lunch, afternoon tea or any snack eaten between breakfast and dinner, will appeal to anyone who loves India and Indian food. Bombay Lunchbox is illustrated with a mixture of vintage imagery and new photographs by Chris Caldicott, bringing together the spirit of the Raj with the brightly coloured buzz of modern India’s culture, religion and society. For many years, Carolyn and Chris Caldicott owned the World Food Café in London’s Covent Garden, where they cooked and served delicious vegetarian food from recipes collected on their travels. They are the co-authors of World Food Café, The Spice Routes, World Food Café 2, World Food Café Quick & Easy, and The Vegetarian Bible, all published by Frances Lincoln. also published by Frances Lincoln. With a title like Bombay Lunchbox you know from the outset the sort of recipes you will be reading about. This is Indian cooking. A fascinating little book with some interesting commentary and different recipes to what you would expect in an Indian cookery book. I was immediately drawn to the opening section How Tiffin came about as Tiffin is something I always remember being mentioned regularly in one of the famous Carry On films. At the time it was just a piece of humour in the film and not something anyone stopped to think about. You can read for yourself all about Tiffin, what it means and how it came about as this is what the book is basically about. You may not have come across a Tiffinwallah from Bombay but now is your chance to be enlightened as to what food and drink they sell on the streets of Bombay! The book contains recipes that are both savoury and sweet, as well as recipes for some of the Indian drinks. Like most Indian recipes they require quite a few ingredients, which does not present any problems as most are now readily available in UK supermarkets. There is a good cross-section of recipes, many of which are vegetarian, so there should be something to suit the tastes of anyone who enjoys Indian food. One of the great attractions of Bombay Lunchbox is its photography which, not only illustrates the food beautifully, gives a colourful insight into Indian life. This leads to the only criticism I have of the book which is its size. It is only a small book and the wonderful photography would have benefited from a larger format but don't let that put you off adding Bombay Lunchbox to your kitchen library. Eggs and potatoes simmered in a rich tomato curry sauce is a rather excellent legacy of the British Empire. Serve with chapatti or rice. Blend the roughly chopped onion, garlic and ginger in a food processor until a paste forms. Stir in the turmeric and chilli flakes and set to one side. Peel the hard-boiled eggs and slash the whites a few times with a knife. Cut the eggs in half lengthwise. Heat the oil in a wok or large frying pan. When it is hot fry the eggs until golden. Remove the eggs from the pan and set to one side. Add the diced potato to the same pan and stir-fry until brown. Scoop the potatoes from the pan with a slotted spoon and set to one side. Fry the sliced red onion in the oil remaining in the wok. When the onion becomes translucent add the cinnamon, cardamom, cloves and bay leaves, stir-fry for a further minute or so, then add the onion spice mix and stir-fry until soft. Add the chopped tomatoes and cook for 5 minutes before stirring in the water, fried potatoes and jaggery. Season the sauce to taste with salt and a good grind of black pepper, lay the eggs on top (yolks up) and gently simmer until the sauce is reduced and the potatoes are soft. Samosas are the perfect size to bridge that gap. 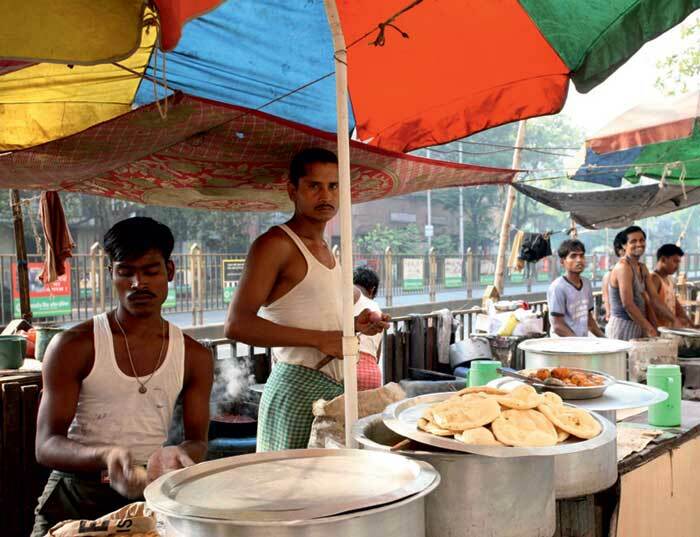 Street stalls and cafés offer freshly made samosas ready and waiting. 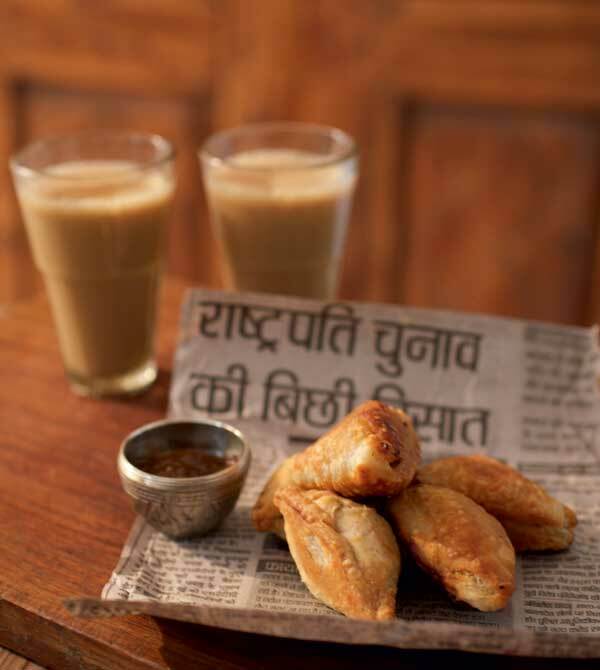 Samosas are simply inseparable from masala chai; together they are a marriage made in heaven. If you prefer a healthier alternative to fried samosas, bake on a greaseproof tray in an oven preheated to 200°C / 400°F for 15 minutes or so, until golden brown. Boil the diced potatoes in salted water until soft. Drain and roughly mash the potatoes until they start to break down, but are not completely smooth. Heat the oil in a small frying pan. Add the cumin seeds and when they start to crackle, add the onion and chilli. Fry together until the onion is soft. Add the garam masala, ground cumin and peas, stir- fry for a few minutes and then stir in the mashed potato. Tip the filling into a bowl and set to one side to cool. To assemble the samosas, roll out the pastry on to a lightly floured surface until thinnish, but still thick enough to handle without breaking up. Cut into 10cm / 4inch rounds, then cut each round in half to make a semicircle. Take a semicircle of pastry, wet the edges, fold in the straight edges to make a cone shape and pinch the edges together to ensure a good seal. Fill the pastry cone with a generous teaspoon of the potato / pea mixture and seal the remaining edges together. Repeat the process until all the ingredients have been used up. Heat enough sunflower oil in a wok to deep-fry the samosas, and fry in batches of 6 until golden brown. Allow the samosas to drain on kitchen paper before serving. 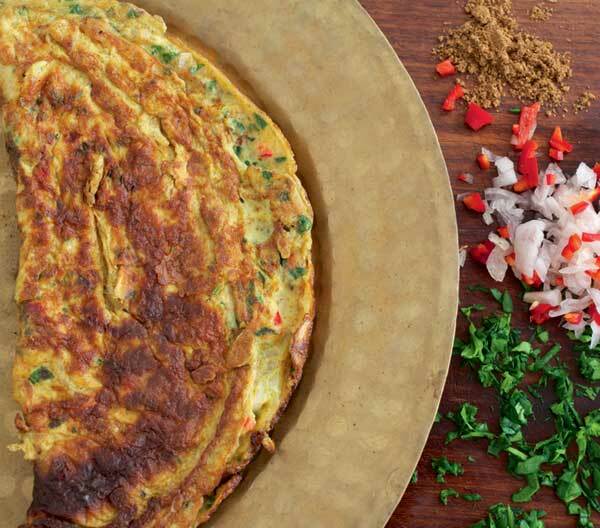 Masala omelette makes a super-quick mid-morning snack or late breakfast. Serve Coffee House style with hot buttered toast. Whisk the eggs and milk together until light and fluffy. Stir in the remaining ingredients, seasoning with salt to taste. Heat a knob of butter in a non-stick frying pan. When the butter starts to foam, add the omelette batter and swirl it around the pan until evenly coated. Reduce the heat to a medium temperature and cook the omelette until golden brown and nearly set. Flip the omelette and cook for a further minute (dont overcook the omelette at this stage or it will become rubbery), before turning out on to a warm plate.